Toys | Ionix - Shapeshift. Build. Unleash! Ionix bricks are like no other. They can shapeshift from brick to hero in a matter of seconds. Unassuming walls become armies and dropships become interdimensional portals. The possibilities are limitless, so what are you waiting for? Shapeshift. Build. Unleash! 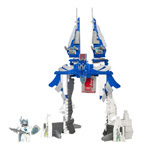 © 2019 Spin Master Ltd.
By clicking "continue" you'll be leaving the Ionix web site and landing on a retail site. Remember, they have different terms and privacy policies. Hope we see you again soon! KIDS, get your parent's permission before visiting other sites and NEVER share any personal info about yourself — including your full name, address and phone number and let your parent or guardian handle any transaction.